India returns to Melbourne for their third successive International Cup. Their first visit Down Under resulted in a series of heavy losses, however at the last tournament the team displayed improvement and secured their first-ever victory, against East Timor. 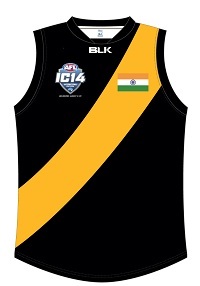 Once again only half the squad will travel from India, however this time the travelling party are official participants in the Australian Rules Football Association of India, representing three of its clubs; Bengal Tigers, Maharashtra Giants and Jharkand Crows. In addition to this, a number of the Melbourne-based players have had regular match time at Masala Football Club, in the Victorian Amateur Football Association; the club having been born out of India’s last International Cup campaign. That growth has been driven by Sudip Chakraborty, a member of the 2008 and 2011 squads and an occasional World Footy News writer. Chakraborty was sufficiently taken by the game to pursue a postgraduate qualification in Sports Management and ultimately establish the Australian Rules Football Association of India (ARFAI). The country now has a formal governing body, although given it is recently established, at-most minor improvement can be expected of the India-based players. Of the Melbourne-based players, most have at least some football experience and a good understanding of the sport’s tactical intricacies. India is fixtured in Pool B, with matches against Tonga, PNG and Pakistan. Based on previous matches, a win against Pakistan is the only likelihood and even this might prove challenging, given the Shaheens extensive preparation. India-based Chakraborty, Mitra, D’Moore and Ghosh all return from 2011 as do Melbourne-based Banerjee, Madeira, Mascarenhas and Kailasanathan. Melbourne-based players currently aligned to clubs will also be amongst the stronger players. Very hard to speculate given the country’s last hit out was three years ago fielding a largely different team. In a best-case scenario India will be a low-finish in Division 1. A worse-case scenario and they struggle to match their one win of 2011.